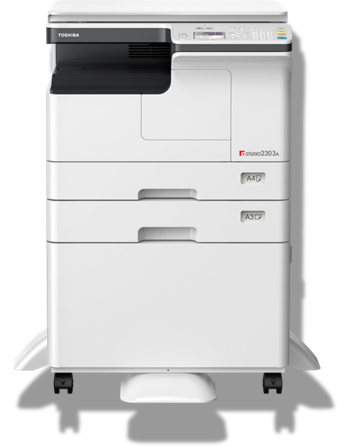 Compact, lightweight A3 size MFP. Convenient & Efficient rotate sorting. background colour when copying originals. Convenient networking printing for small groups. Handles thick paper up to 216 gsm. PostScript print driver & Mobile printing. Print & Copy speed: 23/28 cpm. Warm-up time: Approx. 18 seconds. Stack feed bypass: A3/A5-R (52-216 gsm). Stack feed bypass: 100 Sheets. Max. Paper capacity: 1700 Sheets. Paper exit: Face down/Inner exit (100 Sheets). Processor: Cortex A8 500 MHz. Power consumption: 1.5 KW (220-240 V). Operation noise: 64.75 DB [A]. Auto sleep mode, Auto energy saver. 2400 dpi x 600 dpi (With smoothing). Multiple copy Qty: 1-999/10 Key input. Zoom: 25% to 400% (1% Increment). Automatic / Manual (9 Steps). PCL6 (PCL,XL), PCL5e, PCL5c, PS (Option). Windows Vista SP2 (32/64 bit). Windows 7 SP1 (32/64 bit) SP1 Recommended. Windows 8 / 8.1 (32/64 bit). Windows Server 2008 SP2 (32/64 bit). Windows Server 2008 R2 SP1 (64 bit). Windows Server 2012 / R2 (64 bit). Mac OS 10.6, 10.7.4, 10.8, 10.9, 10.10. Standard: 10/100 BaseT, USB 2.0/Hi Speed. TCP/IP (IP v4/IP v6), Net BIOS over TCP/IP. LPR/LPD, Port 9100 (bi-directional), IPP ver1.1. Resolution: 600 dpi x 600 dpi (Max). Up to 25 spm (Mono), 22 spm (Colour). Scan modes: B&W, Grey scale, Colour. Scan to USB, Remote TWAIN, Scan to file (SMB/FTP), Scan to Email. Data compression method: JBIG, MMR, MR, MH. Modem speed: (33.6-2.4) Kbps Auto Fallback. Transmission speed: Approx. 3 Sec. Max. 32 Groups, 220 detinations per job.